The best 16 oz travel mug? Thread: The best 16 oz travel mug? Re: The best 16 oz travel mug? As of this writing I'm sipping on six-hour old, warm coffee. Sometimes I preheat my bottle with hot tap water before putting the coffee in. It does keep coffee hot for a long time. You are correct about the cap. I totally forgot about how tight it is to open but I am use to it because I like the leak proof and how it insulates better. Simms actually has a travel mug?! That's hilarious! I thought you were kidding, and then I went and looked it up. I guess it shouldn't surprise; Sage offered a humidor for a while. So Abel can't be far behind on the travel mug. 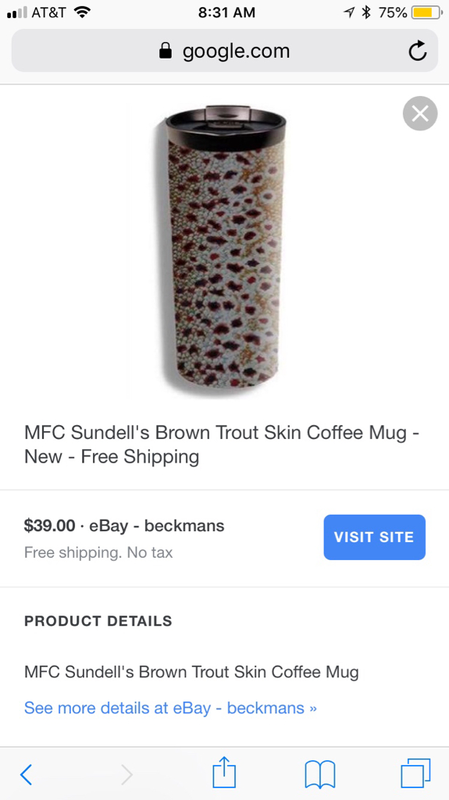 It will cost 3X the Simms, and for another $125 you can get the Brown Trout pattern on it. I think Abel is missing a real revenue opportunity here. I always preheat as well. And insulation and no leaking are more important than an easy to open cap. I'm liking the mug more and more as I get used to this. Also probably ordering a second bottle for my hip pack. I honestly don't know how I lived and fished for so long without them. I recently made an unintended observation regarding the Klean Kanteen that's worth mentioning. After filling it up one morning I forgot to twist the cap and instead left it "open" for about four hours. Surprisingly, the coffee was still hot, which is probably because the lid is designed to retain heat while being open. So, it can actually function as a one-handed mug, for instance when driving, which is really nice. Berkley C5S-7' Cherrywood Travel Pack Spinning Rod with Metal Travel tube.